When I committed to blogging through advent, I thought I would only explore hymns. Those sung Wednesday evenings at church when I was too young to comprehend the “preparing my heart” side of the season and was only in it for the music…and homemade desserts afterwards. Songs that sound magical to bells, reflective to the organ’s pipes, or glorious with those same pipes only different stops pulled (it is the wonder of the pipe organ). But there is this song. Written in 1984 by a southern gospel singer/songwriter. Not put to music until 1990. A song that reads like a melodic interview. I remember exactly where I was when I first heard it—at some mega church’s Christmas production out in West County, Missouri. I was a young mother with a toddling, glossy haired, brown-eyed boy. My firstborn son–the one who taught me what it meant to love so much I would gladly die so he could live. And all it took was him being born. So, I hope you will forgive my short divergence from our classic Christmas hymn wanderings, especially so early in the journey, in order that we might wonder over a carol not yet three decades old. Isn’t the standard answer Jesus? Doesn’t everyone—okay almost everyone–wish they could walk with Jesus? I am horrible at answering favorites questions: “What’s your favorite…..” My children try to play the favorites game with me, but I’m no fun. I’m horrible at picking favorites. Thus, I am not sure I could definitively proclaim who I would want to meet, but I know Mary, Christ’s mother, would make my top five. And when someday I do see Mary, because I know someday I will, I would like to ask her what it was she pondered in her heart. Did the events surrounding her son’s birth and childhood string themselves together like a giant dot-to-dot puzzle? And did the puzzle ever make a shape she finally recognized? Could she have imagined the shape of a cross before a crown? I raise my children by the days. To look too far into the future is overwhelming. To only live in the immediate is to lack vision and subsequent direction. To over-analyze any situation is to disallow living contentedly with the unknown. Is it presumptive to suggest that Mary raised Jesus, and the rest of her children for that matter, by the days as well? Sure there was that incident at the temple when she and Joseph went to have the baby circumcised. Then the wise men who tracked them down from the Orient after Jesus wasn’t even an infant anymore, bearing their gifts fit only for a king. And the time when she lost him for three days that turned out to be a big scare over nothing. I’ll bet she aged 30 years in those three days. I would have just wanted to lay down and die. But, as extraordinary as these occasions were, they were only solitary events in the bigger sea of daily living. Whispers of holiness living in her midst. Glimpses of God with us, the Great I AM living under her roof, calling her Mama. The lines evoke the mystery. The mystery of God Incarnate. The mystery of The Almighty who came down as a child, was willing to live as a man, die the death of thug, and now prepares a place for us—for me–at His Table. Here is the real reason why I can’t leave this song alone: I am drawn in by the questions for Mary, but I am gripped by the mystery of Christ dying for me and now living in me. I live by the days, no different than she. There are glimpses—occasions of transcendence, whispers from His heart—but on the whole, I live somewhere in the balance of immediate and visionary, tending to the here and now, praying for direction for the future. 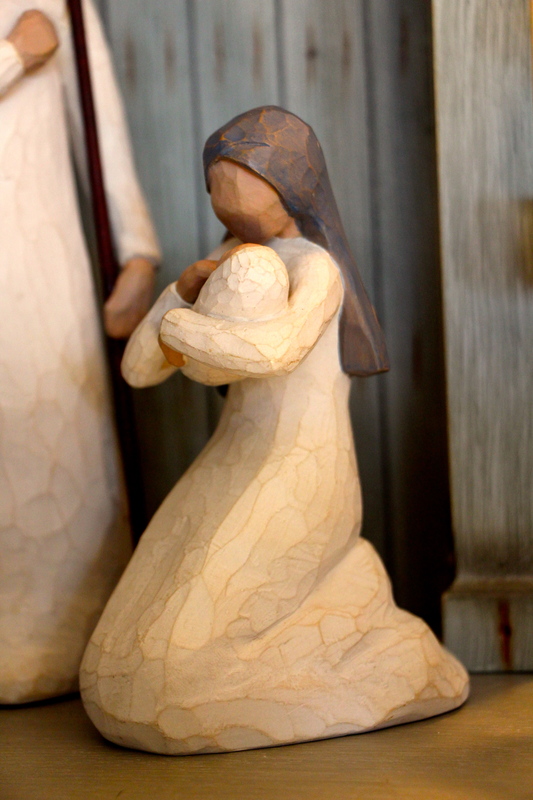 And no different than she, Christ dwells with me—in me, even. I am a walking mystery: Christ’s fullness in me—He who is head over every power and authority, willing to abide with me by the days.